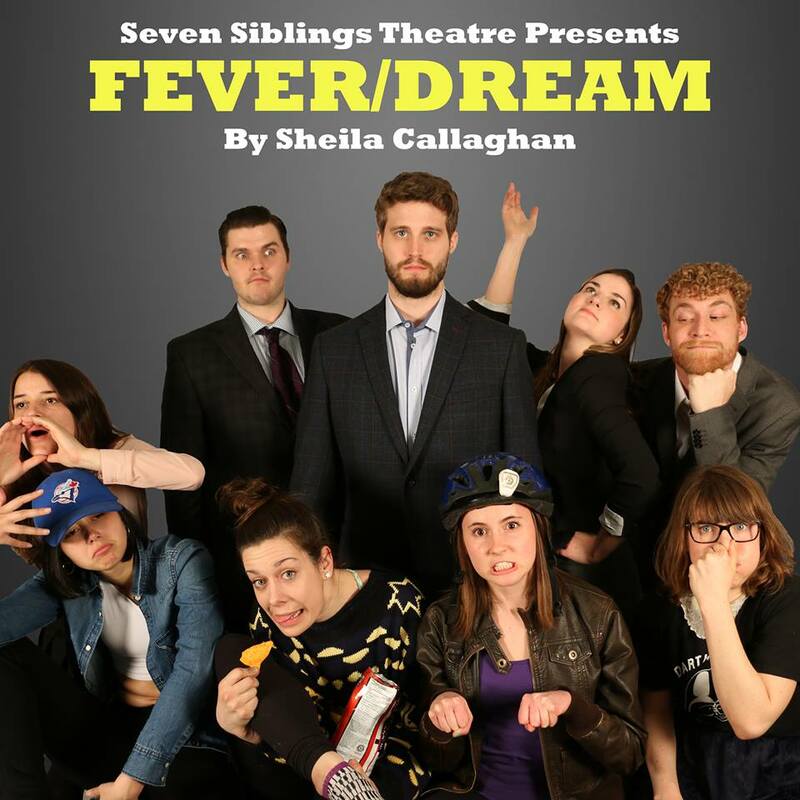 Out at the theatre one more time last night – this time, to The Jumblies Ground Floor for Seven Siblings Theatre’s Canadian premiere of Sheila Callaghan’s Fever/Dream, directed by Will King, assisted by Madryn McCabe. 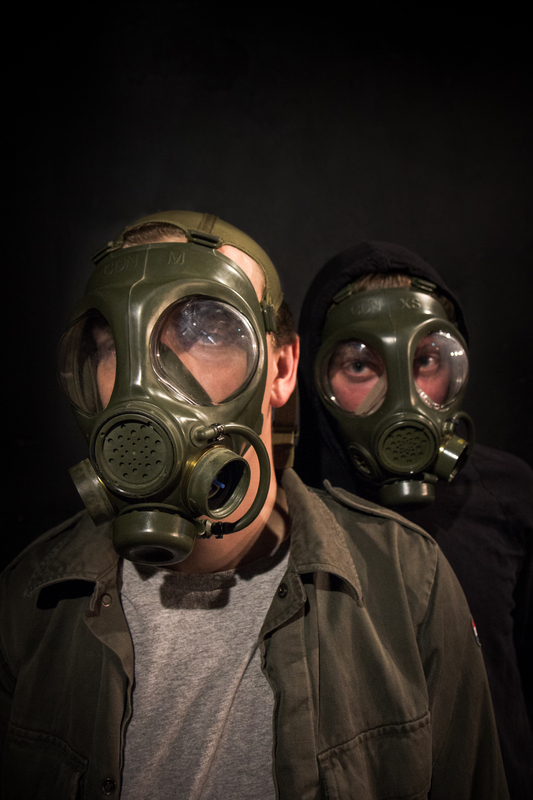 I saw Seven Siblings’ dramatic, violent and compelling production of Mercury Fur last year – and this exciting young company goes for the edge while venturing into the comic side of a surreal world in Fever/Dream. An adaptation of Pedro Calderón’s Life Is a Dream, Callaghan set Fever/Dream in present-day America, where the king is President Bill Basil (Mladen Obradovic), the head of a corporate empire in his 77-foot tall office tower palace. It is in the bowels of the tower that we first see Segis, our young protagonist (Trevor Ketcheson), seated and unconscious at his desk. His hair and beard long and unkempt, his clothing torn and filthy, he resembles a castaway more than an office worker. Prisoner, more like it. The phone receiver seems permanently attached to his hand and he is chained to the desk, his daily food rations dispensed from a trap door in the wall near the ceiling. The only words he can seem to speak are the scripted lines of apology and transfer action – he is a customer service rep. His lack of human contact becomes apparent with the arrival of Rose (Olivia Orton) and Claire (Alexandra Simpson), who’ve become lost in the building. The two girls are soon busted by the office manager Fred (Dylan Mawson) and are sentenced to working in the office. President Bill Basil is seriously ill and has decided to retire; but instead of passing the reins to his two top managers Stella (Geneviève Trottier) and Aston (Peter Jarvis), he has decided to pass the job along to his secret son, with Stella and Aston as Plan B. Guess who the secret son is. Add to the mix a chorus of multitasking actors playing security guards, accountants and vlogging associates (Karina Bradfield, Zenna Davis-Jones and Courtney Keir), and you have a recipe for a wacky tale of chain reaction events and secrets revealed in a crazy, satirical look at corporate culture. King and McCabe have a sharp, engaging cast for this underdog trip down the rabbit hole – or, in this case, up the office tower. Ketcheson does a marvelous job as Segis, going from a feverish grasping for language and meaning to rising up as he discovers love and purpose; lost and disoriented, he struggles to find his way even as he grapples with his own emotions in a strange new world. And is it all even real? Orton gives Rose a sharp sense a drive and commitment; wry-witted and resourceful, she too has a secret agenda and is forced to deal with a surprise discovery of her own. As Rose’s chirpy roommate Claire, Simpson does a bang-up job as the super positive and loyal sidekick, transferring these skills to her job as the perfect office temp; but when she realizes that hers is a Sisyphean task, that bubbly personality boils over. Jarvis is a slick piece of work as Aston, the classic all sizzle and no steak equation, but with people skills that complement Stella, who is more qualified but short on soft skills. Trottier shines as Stella, a brilliant but icy dragon lady, a Harvard and Wharton grad frustrated by corporate sexism, and finding herself melting into her warm feelings for the new boss. Obradovic brings a regal ruthlessness to Basil, moved by vengeance to disown and banish his own son to the basement, only to promote the unprepared Segis in an act of hubris in order to continue his bloodline. As Basil’s right-hand man Fred, Mawson is a chilling master of corporate speak, executing Basil’s every whim and cleaning up messes with clock-like precision and accuracy; but, like Stella, he is not without a soft spot. Chorus members Bradfield, Davis-Jones and Keir are multitasking machines, executing set changes in character and shifting from security detail to accountants to vlogging 20-something associates and back again with skill and style; they may be representing the lowly drones of the business – but work doesn’t get done without worker bees. And their daily workday lives of white noise get turned up to 11 when they find inspiration in Segis. Whether peasant or king – worker drone or president – we all must come to grips with our own mortality. Absolute power corrupts absolutely – so aptly illustrated in Segis’s caricature behaviour in his brief time as president, becoming a tyrant despite his good intentions. 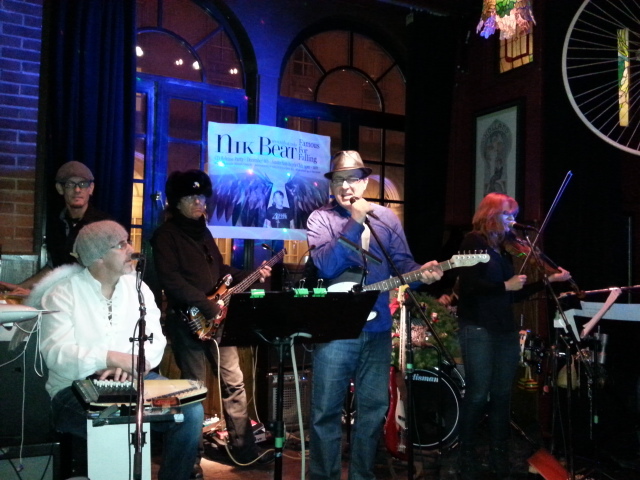 With shouts to some excellent staging and design. The white, sterile set with its secret doors (Stephen King); the back scrim projections (Will King) of skyline and industrial cogs add to the surreal, industrial atmosphere; and the hopeful sound of water burbles up through white noise, and office machine lights, beeps and squeals (Parker Nowlan). The slow, romantic ocean fantasy sequences (choreographer Rosslyn King) and retirement party pandemonium (fight choreographer Annemieke Wade) are highly evocative and entertaining, moving and dream-like. Fever/Dream is a topsy-turvy look at the bizarre dynamics of the corporate world, fueled by a fine, high-energy cast. Fever/Dream continues at The Jumblies Ground Floor until May 31. NOTE: Jumblies is located at 132 Fort York Blvd., a bit east of Bathurst – Google searches may direct you to the Scarborough location and Google Maps shows the address as west of Bathurst (don’t go there!). You can purchase advance tix online here.